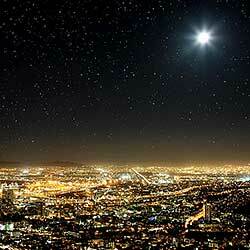 Learn how easy it is to fill your night skies with a field of stars in Photoshop! You'll learn how to create stars in Photoshop, how to add a glow and color to the stars, and how to blend the stars effect with your images! There's nothing quite as peaceful as being outdoors at night, looking up at a clear sky, and seeing an endless field of stars stretching off in all directions. And there are few things as frustrating as trying to capture those stars with your camera. 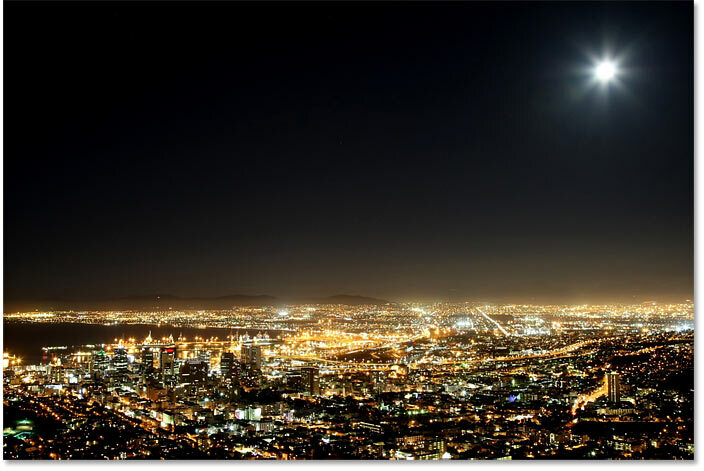 Competing lights from the city or other nearby sources can throw off the exposure and push your stars into darkness. And with our planet always spinning, capturing that faint star light with long exposures often results in a blurry mess. 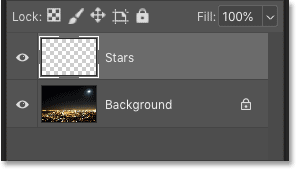 Thankfully, as we'll see in this tutorial, it's easy to add stars to your images with Photoshop! And since we're creating the stars ourselves, we have complete control over just how "starry" the sky appears. In fact, the techniques we'll be learning here are the same ones used to create star-filled backgrounds in movies. So while the results probably won't fool any astronomers in the family, this star effect is more than realistic enough for pretty much everyone else. 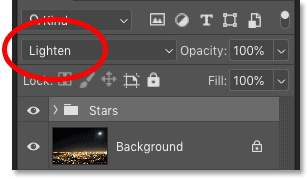 For best results with this tutorial, you'll want to be using the latest version of Photoshop CC, but you can also follow along with Photoshop CS6. First, we'll learn how to create stars in Photoshop, and then we'll learn how to blend the stars with your image. 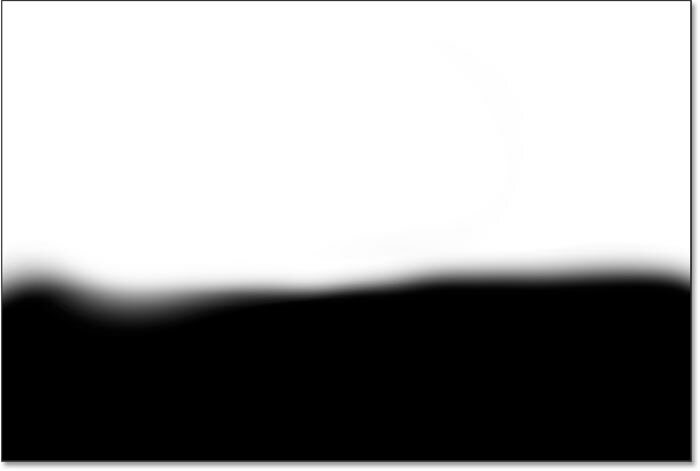 The Background layer is currently the only layer in the document. 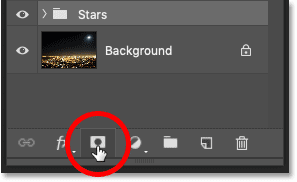 Clicking the Add New Layer icon. 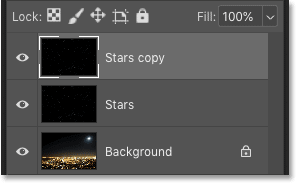 Naming the new layer "Stars". 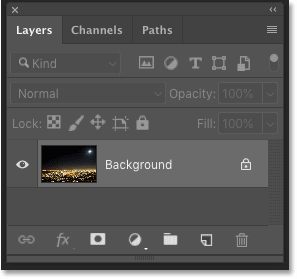 The Layers panel showing the new "Stars" layer. The result after filling the "Stars" layer with black. Going to Filter > Noise > Add Noise. The Add Noise filter settings. 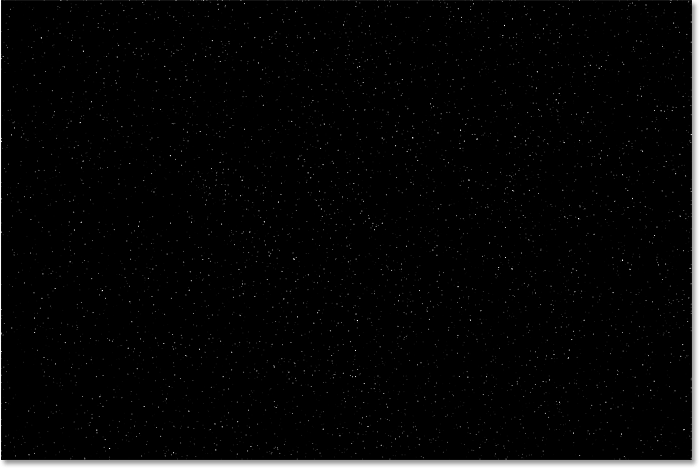 The result after filling the 'Stars' layer with noise. 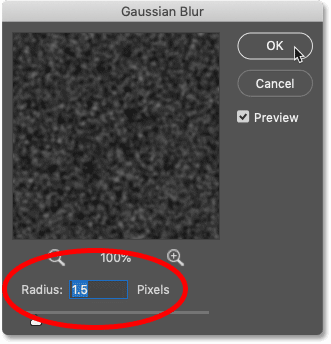 Setting the Radius value to 1.5 pixels. Going to Image > Adjustments > Levels. 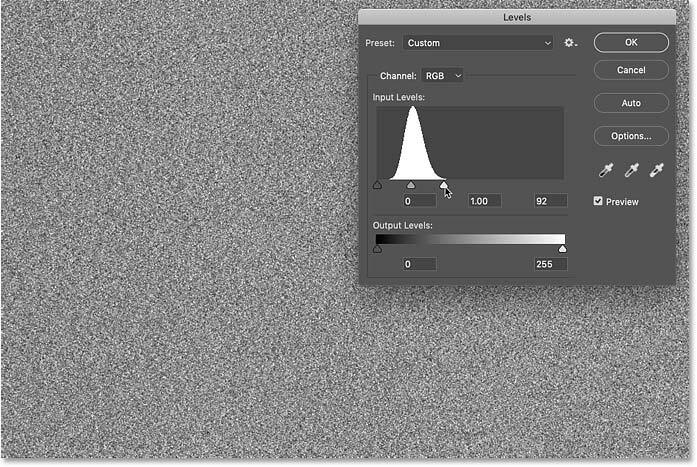 Dragging the white point slider to the right edge of the histogram. The result after dragging the white point slider. Dragging the black point slider to the right to darken the noise. 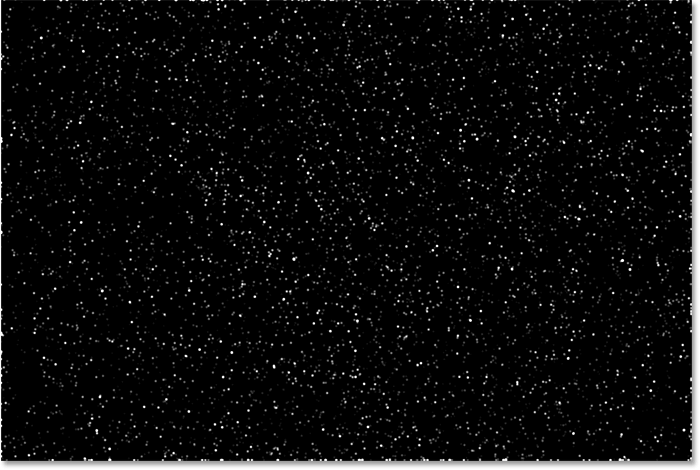 At the moment, our stars just look like white dots. Let's help them look more like stars by adding a faint glow. Then once we've added the glow, we'll add some color. 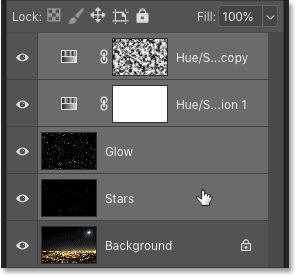 Step 6: Make a copy of the "Stars" layer and name it "Glow"
The new "Stars copy" layer. 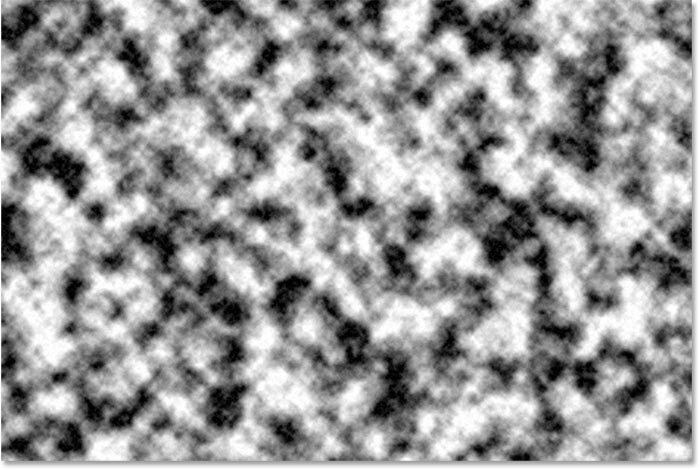 Increasing the Radius value to 4 pixels. Going to Image > Auto Contrast. The result after applying the Auto Contrast command. 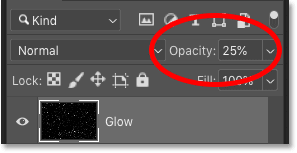 Lowering the opacity of the "Glow" layer. The result after adding the glow to the stars. Next, let's add some color to the stars, and we'll do that using a Hue/Saturation adjustment layer. Stars often appear as either blue or a reddish-orange, so we'll start by adding blue. 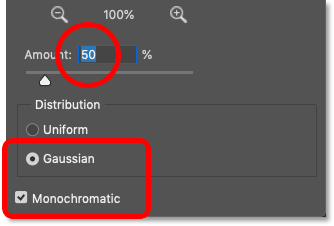 The Hue/Saturation options in the Properties panel. 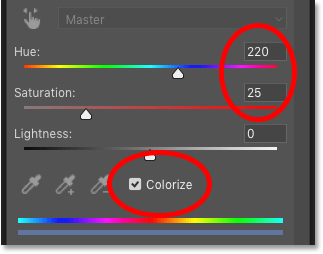 Changing the blend mode of the adjustment layer to Color. The result after colorizing the stars blue. 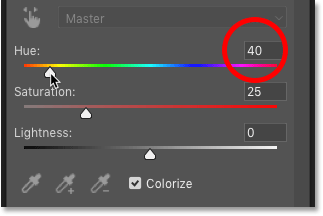 Changing the Hue value to 40. 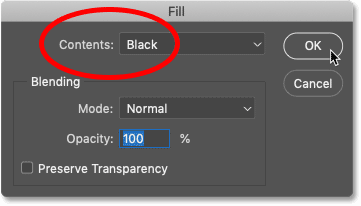 The Color blend mode is already selected. The result after colorizing the stars orange. 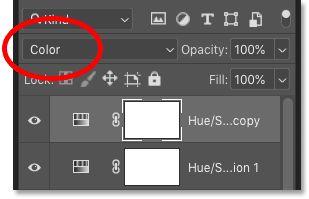 A nice feature of adjustment layers in Photoshop is that they include a built-in layer mask. 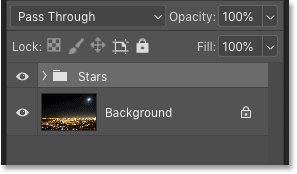 To add randomness to the color of the stars, so some appear blue and others orange, we'll apply Photoshop's Clouds filter to the second adjustment layer's mask. Selecting the adjustment layer's mask. The default Foreground (upper left) and Background (bottom right) colors. 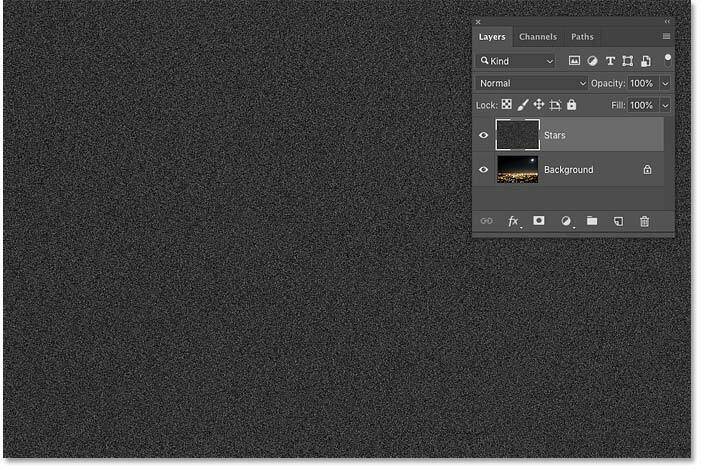 The Clouds filter will fill the layer mask with random areas of white, black and gray. But by default, the result is more gray than anything else. To push more of the effect to pure white and pure black, press and hold the Alt (Win) / Option (Mac) key on your keyboard. 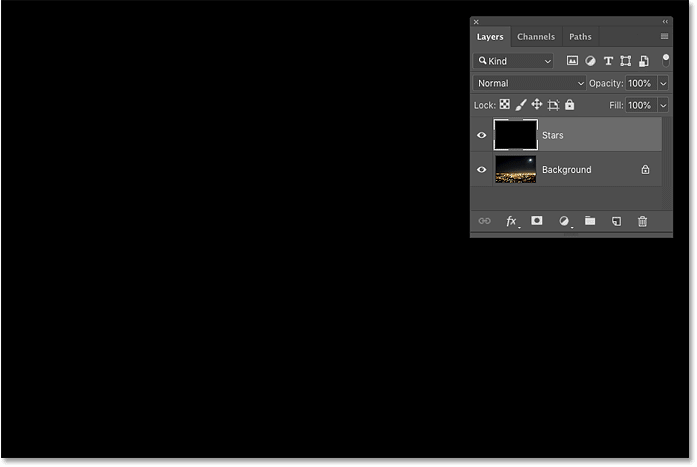 Then with the key held down, go up to the Filter menu, choose Render, and then choose Clouds. Going to Filter > Render > Clouds while holding Alt (Win) / Option (Mac). The effect after applying the Clouds filter to the layer mask. 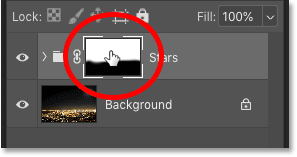 Clicking the mask thumbnail while holding Alt (Win) / Option (Mac). Viewing the effect of the Clouds filter on the layer mask. 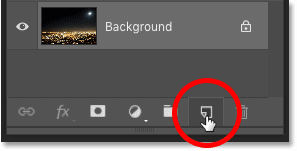 Alt / Option-clicking a second time on the layer mask thumbnail. Hiding the mask and viewing the stars. Related: Photoshop's layer mask tips and tricks! So now that we've created the stars, let's learn how to blend the stars in with the image. 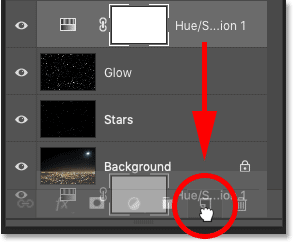 The first thing we need to do is take all four layers that make up our stars effect (the "Stars" and "Glow" layers, plus the two Hue/Saturation adjustment layers) and place them into a layer group. 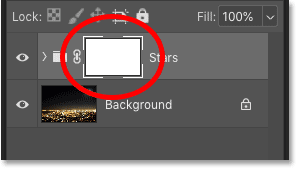 Select the top layer, then hold Shift and click on the "Stars" layer. Choosing "New Group from Layers". 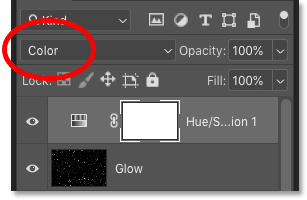 Naming the layer group "Stars". All four layers are now inside the "Stars" group. Changing the blend mode of the "Stars" group to Lighten. Lighten vs Screen - What's the difference? Blending the stars with the image using the Lighten blend mode. 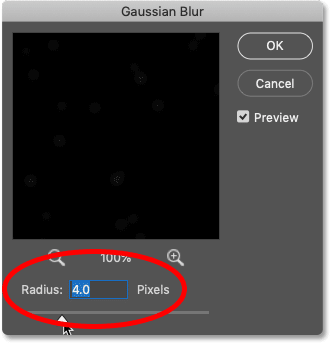 Related: The Top 5 blend modes you need to know! 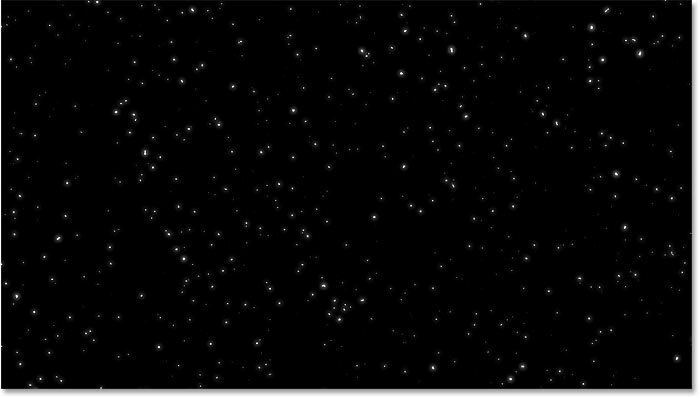 To finish off the effect, all we need to do is hide the stars in the areas where we don't want them to appear, which is everywhere except the sky. And to do that, we'll paint those areas away using a layer mask. Adding a layer mask to the "Stars" group. The white-filled layer mask thumbnail. Press "X" to set your brush color to black. The Brush Tool options in the Options Bar. 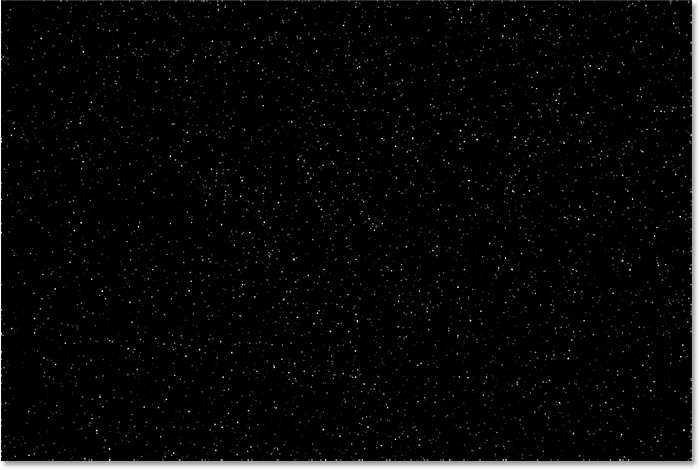 Then simply paint over the areas in the image where you want to hide the stars. To change your brush size from the keyboard, use the left and right bracket keys ( [ and ] ). The left bracket key makes the brush smaller, and the right bracket key makes it larger. Painting with black on the layer mask to hide the stars from in front of the city. 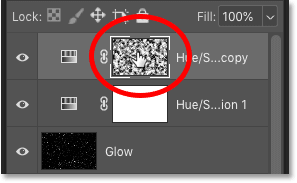 Alt / Option-clicking on the layer mask thumbnail. Viewing the layer mask to see where I've painted. 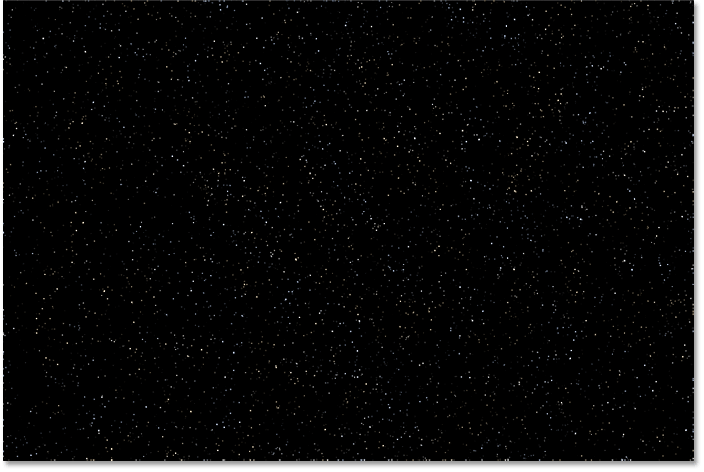 If you make a mistake and paint away the stars in an area where you meant to keep them, press X on your keyboard to set your brush color to white and paint over the area to bring the stars back. Then press X again to set your brush color to black and continuing painting over other areas. The edges of the effect need to be cleaned up. Painting with a small brush to hide unwanted stars along the edges. Click the visibility icon to turn the Stars effect on and off. And there we have it! 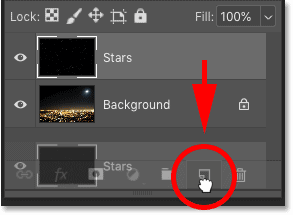 That's how to add stars to your images with Photoshop! Check out our Photo Effects section for more tutorials! And don't forget, all of our tutorials are now available to download as PDFs!